Looking back on the birth of the Protestant Reformation. Harline (History/Brigham Young Univ. ; Way Below the Angels: The Pretty Clearly Troubled but Not Even Close to Tragic Confessions of a Real Live Mormon Missionary, 2014, etc.) acknowledges that biographies of Martin Luther, especially in this, the 500th anniversary year of the Reformation, are quite commonplace. His own work, therefore, is written to introduce lay readers to the tumultuous events from 1517 to 1522, which shaped the Western world and Christianity from then on. This short period saw Luther transformed from an unknown monk into the most famous thinker in Europe, as well as the power of the Roman Catholic Church and its unquestioned papacy begin to slip away from parts of northern Europe. Harline tells this tale in a folksy style meant to draw readers into the world of 16th-century Europe, focusing less on stodgy facts and more on personal details. He begins with Luther’s move to the now-famed town and university of Wittenberg, where, under the influence of his mentor, Johann von Staupitz, Luther would come to a new view of salvation that countered much of what was taught by the church. It was his decision to take on the abuses of papal indulgences, however, that caused him to become a figure of both exaltation and contempt. In trying to purify the church’s practices, he ran headlong into the power of the pope. Nevertheless, regional politics, and a popular feeling among Germans that they were tired of Italian control, provided avenues for Luther to keep speaking and writing, whereas in previous generations, he may have been burned for heresy. 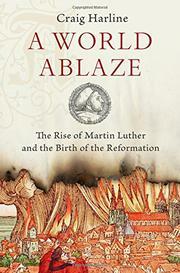 Harline takes readers up to Luther’s return to Wittenberg after a period of hiding in Wartburg Castle. Though far from a complete history and not a source of new material, the book achieves Harline’s stated goal of producing an approachable, worthwhile introduction to the beginnings of the Reformation.